On the 2nd of April, the children of Denmark will celebrate the birthday of the most popular ‘Teller of Tales’ with a story reading party. Called “Odin Story Day,” Hans Christian Anderson’s stories are read out to groups of children, conjuring up for them images of Thumbelina, The little Mermaid, The Ugly Duckling and many other characters from his fairy tales. His aim was to fill the lives of young boys and girls with joy and laughter and drive away the sadness which they were experiencing. Memories of his own poor deprived childhood made him compassionate and filled him with concern for the deprived children of the world. He never forgot the moments of happiness he enjoyed when his father read him a story every day at 2 p.m. after a frugal meal. Hans’ father was an impoverished shoemaker. But he was self-taught and a free thinker, who had great ambitions for his son. The stories served a dual purpose. They got his creative juices flowing and took his mind off his hungry, growling stomach. But the shoemaker died when Hans was eleven years old, leaving the boy at the mercy of an irritable and illiterate mother, who could not empathize with his dreams and aspirations. So at the age of fourteen, Hans ran away to Copenhagen. Also at Odense, very close to St. Knud’s Cathedral, a cobbled street leads to a tiny house covering 18 square metres, where Hans lived between the ages of two to fourteen. Memories of difficult days he spent here are reflected in his stories. Here on display is an exhibition of photographs and artifacts that link him to this small town. Alone in Copenhagen, it was a tough time earning a living. But all through those dark days, he clung to his dream of acquiring a formal education. He begged, pleaded and cajoled the rich to help him. He did house jobs in the homes of the wealthy or in theatres, to keep body and soul together. But he never lost sight of his dream. Even the king heard of this unusual beggar. With his pinched cheeks and long nose, he was never a handsome boy, and though he got to play bit parts in the Danish Royal Theatre performances, he was packed off when his voice began to crack. But persistence paid and his luck eventually turned when the Director of the Royal Theatre Jonas Collins, became his mentor. He arranged for Hans to attend Grammar School of Stalgaise and to board in the house of the headmaster. The latter was a tyrant who subjected the young boy to untold physical and mental torture. Collins withdrew him from the school and had him tutored privately until he was ready to enter university. In Copenhagen there is much to keep his memory alive. 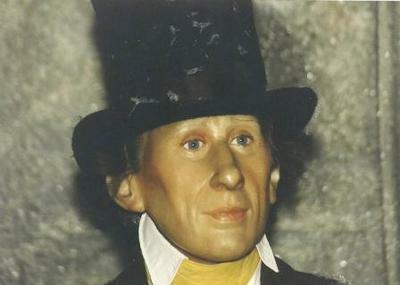 The Louis Tussaud Museum has a section where his stories come to life. 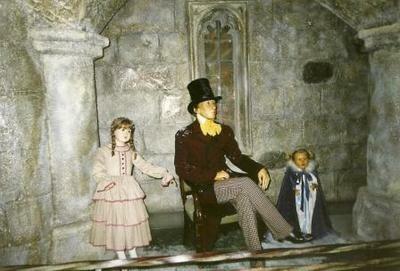 He is depicted sitting on a chair, surrounded by children listening to his stories. Across the street is the Hans Christian Boulevard over which his statue presides. 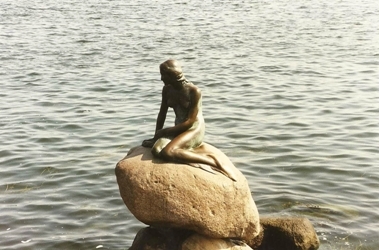 In the harbour is the Little Mermaid seated on a solitary rock and looking wistfully down. Hans’ last few years were spent Nyhavn, where his room with its furniture, books, famous top hat and trunk are preserved. Here again is a wonderful library with 20,000 volumes in different languages. Hans’ books have been translated into 80 languages. Many of the original illustrations for his books created by Danish and International artists are also on display. In the spacious Commemorative Hall are frescoes executed by the artist Niels Larsen Stevns, depicting various stages in the life of Hans. Hans died of liver cancer on August 4th 1875. He was buried in Assistens Kierkegaard Cemetery, which was once a burial ground for paupers. But by the time of his death, others were also buried there, as burials were prohibited inside the city. In those days there were many grave robbers. Sometimes people were buried even before they were fully dead. Anderson had a great fear that he would either be disrobed by robbers or buried when still alive. He lies peacefully in the oldest section of the graveyard at Norreport, in the company of many great men like Soren Kierkegaard the philosopher and Christian Kobe the painter. His headstone is a simple brown marble slab. Your comments are so encouraging, Pankaja. So much of information about the man who gave us reams in our childhood! Enjoyed reading it,so will all !